We are very proud of our high school! Portland St. Patrick is the only high school in the diocese which is fully supported by a single parish. 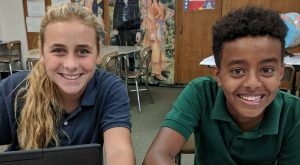 Our students consistently score the highest of any other school in the area on standardized testing; 100% of our students graduate and over 98% of them go on to college. 14 of the 26 students are members of the National Honor Society. 13 were recognized as CMAC Scholar Athletes meaning they had at least a 3.4 GPA and lettered in at least two sports, one of which was in their senior year. 24 out of the 26 plan to go on to higher education with two working on apprenticeships. One has signed a National Letter of Intent to participate in college softball Franciscan University of Steubenville. 10 are graduating with honors (3.79 GPA or higher) with seven of those having a weighted 4.0 GPA or higher. 24 have a GPA of 3.0 or higher. They were offered a total of $270,000 in scholarship money. They have accepted approximately $100,000 of that money from the schools they plan on attending in the fall. Bus transportation is provided by Portland Public Schools. If you have question, please contact the bus garage at 647-2993. High school students who will be riding the bus should contact the bus garage to notify them and make arrangements. Each child has their own computerized lunch account. Cash or checks may be applied at any time to this account. Please make checks out to Portland Food Service (PFS). Elementary please send money in a clearly marked envelope to your classroom teacher. Middle/high school students SHOULD bring their money to the cafeteria. When your child will be absent from class, please call the school office no later than 7:30 a.m. for high school students or 8:30 a.m. for elementary students. When calling with dismissal messages, please call no later than 3:00 p.m.
Students who must leave school early are to obtain a pass from the office prior to the start of school. Parents must provide written request, stating the reason for early dismissal before the office staff will issue a pass. Students who leave for an appointment and return before the end of the regular school day must report to the office upon return. Information regarding early departure and time of return will appear on the daily attendance log provided to teachers. When entering or leaving the building at other than regular times, students are to come to the office and sign in/out. We do encourage parents/guardians to arrange their vacations so they do not interfere with the regular school calendar. Absences will be considered unexcused if the guidelines are not followed, in which case the student will receive a zero for all work missed. Absences must be verified by 9:00 a.m. the next day or the absence may remain unexcused. If your child’s after school transportation will be different from normal, send a note to the child’s teacher, if possible. For last minute changes, call the school office by 3:00 p.m.